The anatomy of the lower limb includes the foot, leg, thigh and the gluteal region. The lower limb comprises of four major parts i.e. a girdle formed by the hip bones, thigh, leg and foot. The human lower limb is specially adapted to bear weight in an upright position and to walk. The gluteal muscles, extensors of the knee and the posterior calf muscles are mainly involved and, hence, specialized to suit these needs. The posterolateral surface of the buttocks constitutes the gluteal region. The muscles of the gluteal region, namely, the glutei maximus, medius and minimus, form the bulk of the buttock arranged from superficial to deep. Posterior to the bony pelvis, the mass of muscles in the gluteal region is limited by the inferior gluteal cleft inferiorly and the intergluteal cleft medially. They are supplied by gluteal nerves and arteries approaching through the greater sciatica foramen. The gluteus medius and minimus are fan-shaped and are positioned deep to the gluteus maximus. Laterally, the tensor fasciae latae helps to stabilize the lateral aspect of the knee joint. The gluteal maximus is a large muscle with numerous attachments. Gluteus maximus Ilium posterior to posterior gluteal line, posterior sacrum and coccyx and sacrotuberous ligament. Iliotibial tract (75%) and gluteal tuberosity (25%). Inferior gluteal nerve (S1, S2). Extends hip and assists lateral rotation. Gluteus medius External ilium between anterior and inferior gluteal lines. Greater trochanter of femur. Superior gluteal nerve (L4, L5, S1). It brings about the abduction and medial rotation of the pelvis. It keeps the pelvic level when the opposite limb is off the ground. Gluteus minimus External ilium between anterior and inferior gluteal lines. Greater trochanter of femur. Superior gluteal nerve (L4, L5, S1). Same as gluteus medius; it abducts and medially rotates the pelvis. It keeps the pelvic level when the opposite limb is off the ground. Tensor fasciae latae Anterior superior iliac spine. Iliotibial tract to lateral condyle of tibia. Superior gluteal nerve (L4, L5, S1). This muscle assists in flexing the hip and stabilizing the knee joint. The majority of the lower limb is supplied by the femoral artery. The femoral artery is the direct continuation of the external iliac artery, as it passes deep to the inguinal ligament through the retro-inguinal space. The femoral artery enters the femoral triangle deep to the inguinal ligament. It exits canal via the adductor hiatus to enter the popliteal fossa and becomes the popliteal artery. Within the femoral triangle, the femoral artery gives rise to a branch called the profunda brachii artery which is a deep artery. It passes deep to the adductor longus and supplies the thigh musculature. 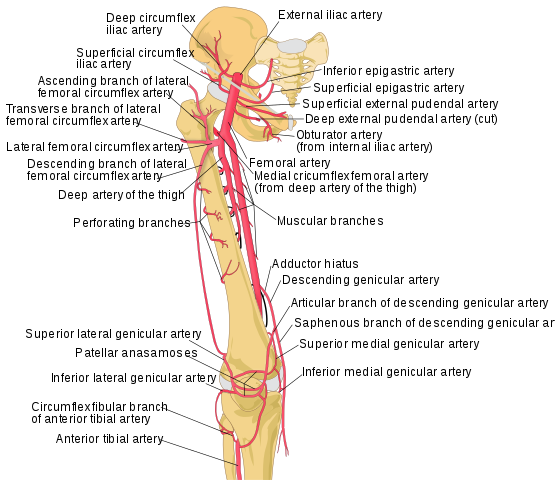 The femoral artery gives rise to lateral and medial circumflex arteries. It courses around the proximal femur. The medial circumflex artery passes deep to the iliopsoas and pectineus. The lateral circumflex artery goes across the joint capsule anterior to quadrates femoris. The gluteal region is supplied by gluteal arteries (internal iliac artery) – important anastomoses may occur between the two. The medial thigh is supplied by the obturator artery (a branch of internal iliac artery). As the femoral artery passes distally, it changes its name to reflect its new location. As the femoral artery descends through the thigh, perforating arteries (branches of femoral artery) course around the femur to supply adductor magnus and posterior compartment of femoral triangle. There are 2 gluteal arteries, namely, the superior and inferior gluteal artery, respectively. They arise from the internal iliac artery within the pelvis. 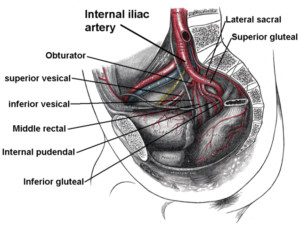 While the superior gluteal artery enters the gluteal region by passing through the suprapiriform (above piriformis) foramen, the inferior gluteal artery passes through the infrapiriform foramen. The superior gluteal artery supplies the gluteus medius, minimus and tensor fascia lata muscles. The inferior gluteal artery supplies the gluteus maximus, obturator internus, quadrates femoris and proximal posterior thigh muscles. First perforating artery: Ascending branch. 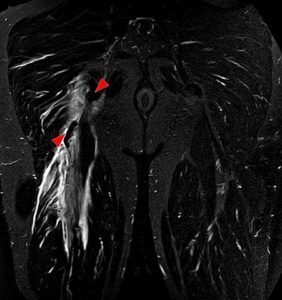 The piriformis muscle is an important landmark for neurovasculature relations in the gluteal region. Superior — Superior gluteal artery, vein and nerve. 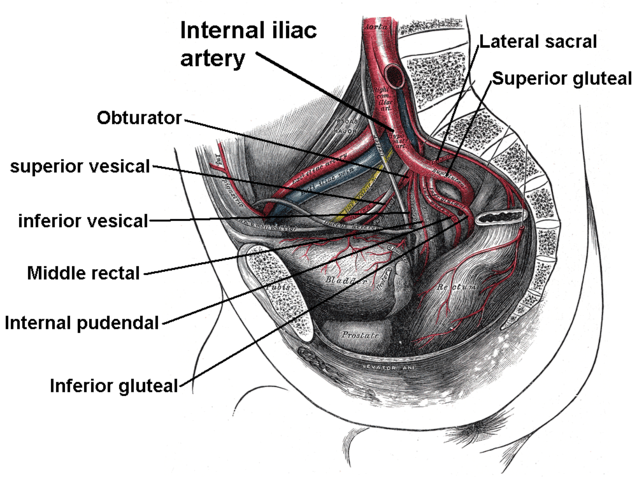 Inferior — Inferior gluteal artery, vein and nerve. Inferior — Sciatic and posterior cutaneous nerve of the thigh. Inferior — Pudendal neurovascular bundle (then enters the perineum via the lesser sciatic foramen). Superior gluteal nerve (L4,5,s1) – supplies the gluteus medius and minimus, tensor fascie latae. Inferior gluteal nerve (L5,S1,2) – supplies the piriformis muscle and gluteal maximus. Posterior femoral cutaneous nerve (S1,3) – supplies the calf muscle. 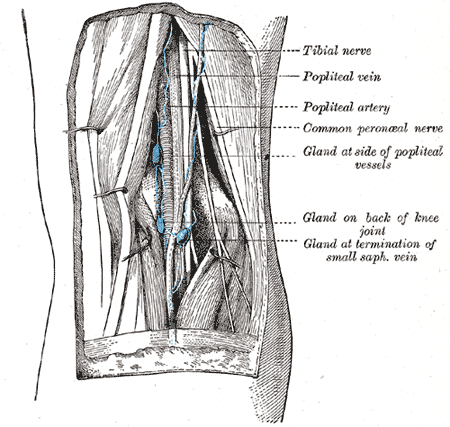 Pudendal nerve – supplies the piriform muscle. Sacral plexus (L4,S3) – supplies the obturator externus and internus. The majority of muscles in the thigh act on the hip and knee joint. There are two types of movements possible, namely, flexion/extension and adduction. Abduction is performed by muscles in the gluteal region. The posterior thigh muscles bring about lateral rotation, extension of the hip and flexion of the knee joint. Quadratus femoris Ischial tuberosity Intertrochanteric crest Nerve to quadrates femoris (L5, S1) Lateral rotation, and holds head of femur in acetabulum. ‘Hamstrings’ muscles are present posterior to the femur bone in the thigh. The semimembranous, semitendinosus and long head of biceps femoris constitute the hamstrings. They originate from ischial tuberosity and insert onto the tibia and fibula, thus, cross two joints: the hip and the knee. 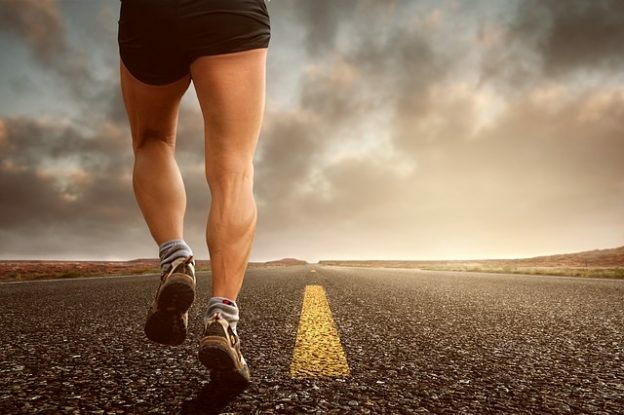 They participate in the extension of the thigh and in flexion of the leg. The short head of biceps is not a hamstring, as it crosses only the knee joint and is innervated via the common fibular nerve. They are supplied by perforating branches which originate from profunda femoris (branch of femoral artery). These pierce adductor magnus to enter the posterior compartment. Biceps femoris Long head: Ischial tuberosity. Short head: Linea aspera and lateral supracondylar line. Lateral surface of fibula. Long head: Tibial division of sciatic nerve (L5, S1). Short head: Common fibular division of sciatic nerve (S1). Flexes knee joint and lateral rotation when flexed. Semitendinosus Ischial tuberosity. Medial surface of proximal tibia. Tibial division of sciatic nerve (L5,S1). Extends hip joint. Semimembranosus Ischial tuberosity. Posterior surface of medial condyle of tibia. Tibial division of sciatic nerve (L5,S1). Flex knee joint and medial rotation when flexed. 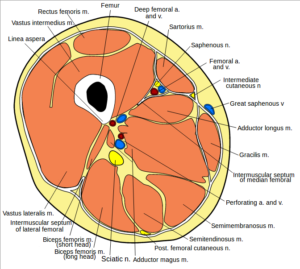 The 3 compartments thus formed are the anterior, posterior and medial thigh compartment. 3 or 4 perforating arteries from profunda brachii pierce adductor magnus to enter the posterior compartment of the thigh. They typically send superior and inferior branches to join with adjacent perforating arteries. Superiorly, inferior gluteal artery and inferiorly, the popliteal artery connect to them. They give branches to the sciatic nerve. Popliteal fossa is a fat-filled, diamond-shaped space located posterior to the knee joint. It contains all the neurovascular structures that pass from the thigh to the leg. All neurovascular structures that pass from the thigh to the leg are basically the contents of the popliteal fossa. Small saphenous vein entering popliteal vein. Popliteal artery and associated branches. Posterior cutaneous nerve of the thigh. The popliteal artery is the direct continuation of the femoral artery within the popliteal fossa. It terminates by dividing into anterior and posterior tibial arteries at the inferior border of popliteus. The gluteal region consists of the glutei maximus, medius and minimus and tensor fasciae latae muscles. They are specialized to bear weight and maintain the horizontal balance of the pelvis, while one leg goes in swing phase during walking. The inferior gluteal nerve supplies the gluteus maximus, while the gluteus medius and minimus are innervated by the superior gluteal nerve. The arterial supply to the gluteal region is derived from the gluteal arteries which make this area an important anastomosis site between the femoral and the internal iliac artery. 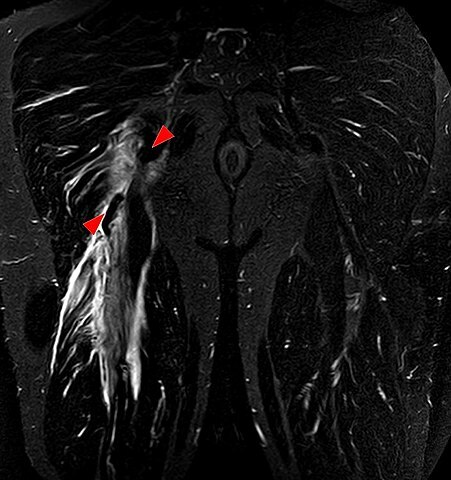 The piriformis muscle is an important landmark for neurovasculature in the gluteal region. The hamstrings bring about flexion of the knee and extension of the hip joint. The semimembranosus, semitendinosus and long head of biceps femoris constitute the hamstrings. The tibial component of the sciatic nerve supplies the hamstrings. Thigh cross section reveals the 3 compartments of the thigh, namely, the anterior, posterior and the medial compartment. 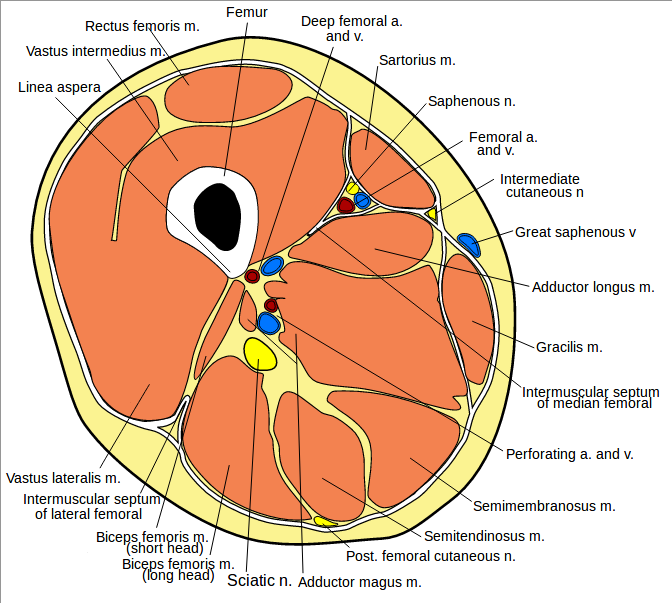 While the anterior compartment muscles bring about mainly extension of the knee and are supplied by the femoral nerve, the posterior compartment muscles are responsible for flexion and are innervated by the tibial nerve. The adductors rule the medial compartment and receive innervations by the obturator nerve. The diamond-shaped, fat-filled cavity behind the knee joint is bound by the gastrocnemius, and the hamstrings. While the popliteal fascia and skin constitute the roof of this fossa, the floor comprises of the popliteal surface of femur, popliteal fascia and muscle. 1. Which of the following is not the content of the popliteal fossa? 2. Which of the following is a part of the cruciate anastomosis in the gluteal region? 3. Identify the insertion site of the piriformis muscle.